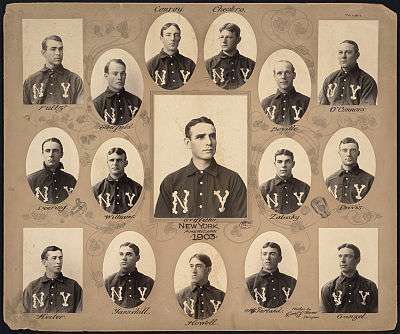 The New York Highlanders' 1903 season finished with the team in 4th place in the American League with a record of 72–62. The team was managed by Clark Griffith and played its home games at Hilltop Park (formally "American League Park"). The season began with the Baltimore Orioles relocating to New York. The club was at first officially the "Greater New York" baseball club, in deference to the established New York Giants. The New York press was creative with analogous nicknames for teams. In addition to "Highlanders", the team would soon acquire the alternate nickname "Yankees". That word is a synonym for "American" in general, and short for American Leaguers or "Americans" in this case. Given the media's penchant for citing popular culture, that nickname was also possibly influenced by the then-current and hugely popular America-centric George M. Cohan Broadway play, "Little Johnny Jones", and its centerpiece song, "Yankee Doodle Dandy". New York writers had similarly coined both the established nickname Brooklyn "[Trolley] Dodgers" and the nickname "Superbas" that the denizens of Flatbush carried for a while. As with the Highlanders, the latter was based on something unrelated, namely a circus act called "Hanlon's Superbas"; the Dodgers were managed by Ned Hanlon at that time.